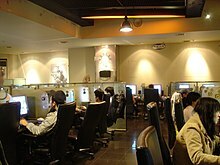 A PC bang (Korean: PC방; literally "PC room") is a type of LAN gaming center in South Korea, where patrons can play multiplayer computer games for an hourly fee. The typical cost for an hour of play ranges from 500 to 1500 KRW (approximately $0.44 to $1.30 USD in March 2017), with 1000 KRW per hour being the most common rate. Although the per capita penetration of personal computers and broadband internet access in South Korea is one of the highest in the world, PC bangs remain popular as they provide a social meeting place for gamers (especially school-aged gamers) to play together with their peers. Aside from the social aspect, PC bangs' ability to offer access to expensive and powerful high-end personal computers, designed specifically for video gaming, at a comparatively low price has also bolstered their popularity. The origin of PC bang starts with 전자 카페(electronic cafe) ('jeonja kape', which literally translates to 'electronic cafe') in South Korea opened in March 1988, which was then closed in 1991. The original creators of the junja kappeh, Ahn Sang-Soo and Geum Nu-Ree, launched this electronic cafe next to Hongik University. At the time, people were able to use two 16-bit computers, which were connected by a telephone line. However, it was only known to locals and not widely known, yet. In April 1994, the first Internet cafe was opened. Jung Min-Ho founded the first public Internet cafe, named BNC, in 서초구 (Seocho District). It gained immense popularity, a first for such type of cafe. From 1988 to 1993, the press had labeled such cafes as "electronic cafe"; however, after the opening of BNC, labels such as "modem cafe", "network cafe", and "cyber cafe" have been introduced by the press. The most played games in PC bangs are known in the industry as massively multiplayer online role-playing games, in which more than 100,000 people around the globe can play at the same time. PC bangs rose to popularity following the release of the PC game StarCraft in 1998. South Korea has developed a thriving computer industry with the Internet use reaching over 50% of the population. As of 2002[update], 25 million citizens are using the Internet, and 14.4 million Korean homes are equipped with Internet access. Accompanying this high rate of home Internet access it is the estimated 25,000 PC bangs that exist as of 2011[update], while in 1997 there were only around 100 PC bangs in South Korea. Many popular Korean multiplayer games provide players with incentives which encourage them to play from a PC bang. For example, the Nexon games Kart Rider and BnB reward players with bonus "Lucci" — the games' virtual currencies — when they log on from a PC bang. Although PC bangs are used by all ages and genders, they are most popular with male gamers in their teens and twenties. Throughout the day, the demographics of the PC room change. Most PC rooms are open 24 hours. In the mornings, the primary type of user is an adult male, between 30 and 50. During the afternoons, young males come in groups between 1-3 pm. During this time is when PC bangs are the noisiest. Around dinner time, teenagers and young adults come in. They usually play online card, arcade, or MMORPG games. Competitive game players (ages 18 and up) start coming in at 8pm and usually stay for several hours or all night. League of Legends, Lineage II, Sudden Attack and Starcraft are the most popular games for late-night players. PC bang industry has created a culture that is participated in by most youth in South Korea. Gamers have turned the PC bang into a socialization facility, becoming a huge part in the lives of the Korean youth today. Many students have suggested that the PC-Bang provides a stress free, fun and youth dominated environment where groups of friends can meet and engage in a cooperative game. They have suggested that the games themselves may promote a social environment by promoting the development of squads or groups of players to play the game more effectively. With computer and Internet access so readily available to the public, both at home and at the PC-Bangs, gaming addiction has become a concern. The consequences of several hours spent at the PC bang gaming and the strong need to compete causes increased addiction and displacement problems of the Korean PC-Bang users. Biggest displacements due to addiction include sleep, school, homework, promises to meet with friends and time spent with friends. As part of its efforts to battle online game addictions among teenagers, South Korea introduced a law that prohibits those aged 16 and under from playing online games between midnight and 6 a.m. The law mainly targets PC online games as well as consoles with online features. It allows a two-year grace period for smartphone and tablet PC games before reconsidering if they should be included, as online game addictions on those platforms are not currently considered a serious problem. South Korean PC bangs have been identified as the source of a large number of players that use software tools to cheat in the video game Overwatch, effectively making play on Asian servers for the game unenjoyable for others. The game's publisher Blizzard Entertainment has arranged deals with many PC bangs to allow anyone using the site to play Overwatch without purchasing the game as part of the hourly fee. Because of the competitive and youthful nature of the average PC bang user, many of these players use tools like aimbots to gain the upper edge in Overwatch matches as to show off to friends. While Blizzard does ban accounts from using these types of hacks, PC bang users can quickly make a new Battle.net account and jump back into the game, using the same tools. Blizzard reports handling thousands of such bans a day from South Korea. From February 2017 onward, Blizzard requires Korean players to log into a Battle.net account as to other play Overwatch and other Blizzard games. As creating a Battle.net account requires unique personal information including difficult-to-spoof Korean social security numbers, Blizzard anticipates this will limit creation of throwaway accounts and alleviate the situation. ^ "PC방" is the usual transcription in South Korea. "피시방" and "피씨방" are transcription of exclusive use of Hangul. The former corresponds to South Korean standard orthography for writing loan words (외래어 표기법), but many South Koreans wrote as the latter when using Hangul exclusively. ^ "The Emergence of PC Bangs in a Dedicated Gaming Place". Internationalexperts. Archived from the original on 2016-01-26. ^ Kim, Tae-gyu (2007-07-23). "`PC Bang' Emerges as New Way of Promotion". The Korea Times. Retrieved 2009-04-05. ^ a b Wohn, Yvette (2010-07-08). "The pc room (pc bang) culture". Play as Life. Archived from the original on 2013-10-18. ^ "Most played games in PC Bangs". Gamemetrics. ^ D'antansio, Cecila (February 2, 2017). "Why Overwatch Hacking Is Such A Big Problem In Korea". Kotaku. Retrieved February 2, 2017. ^ Ashcroft, Brian (February 14, 2017). "How Blizzard Is Combating Korea's Overwatch Hacking Problem". Kotaku. Retrieved February 14, 2017.